Not much of wire work today. Got one TAW bracelet done today but I am not showing the picture of this piece as it is similar to this one. 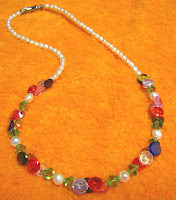 The picture shown here is a stringed piece of necklace of crystal and pearl. A gift for Ahmi.